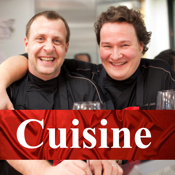 Cuisine was Gourmand World Cookbook Awards 2012 finalist and finally ranked in Top-3!!! Cooking has never been this easy. Or this much fun! Now, iPad brings two chefs into your kitchen! Two Chefs. Four Countries. One Extraordinary Friendship. The friendship of Finnish Jani Lehtinen and French David Denis is one of the most satisfying culinary friendships since soup and sandwich, meat and potatoes, or shrimp and grits. This friendship is flavored with restaurateur’s co-operation and the best combinations of Finnish, French, Italian and American tastes. Not to mention having fun. And the people, places and things, which truly make the dishes spectacular! · Develop recipes, add notes and remember your favorites.